Yesterday evening R, Hazel & I made pancakes (surprise, surprise). For some reason I decided to make double so "I could have them for breakfast the next morning". This turned out to be a really bad plan and as well as having them for breakfast this morning, tonights dinner consisted of baked beans, MORE pancakes, and a fried egg. It worked better than I expected it to. The pictures came out a bit rubbish (something about our kitchen is TERRIBLE for pictures). I had the ISO waaaay up & shot at about 4.0 but for some reason they still came out super-dark and/or really blurry. Carrying a tripod down 2 flights of stairs just to photograph pancakes seemed a tiny bit extreme, so I gave up and just stuffed my face instead. I'd been on an unsuccessful mission earlier in the day to locate chocolate spread and I'd resigned myself to lemon juice and sugar when Hazel turned up with After Eights. After Eights. In pancakes. So, so, unbelievably good. 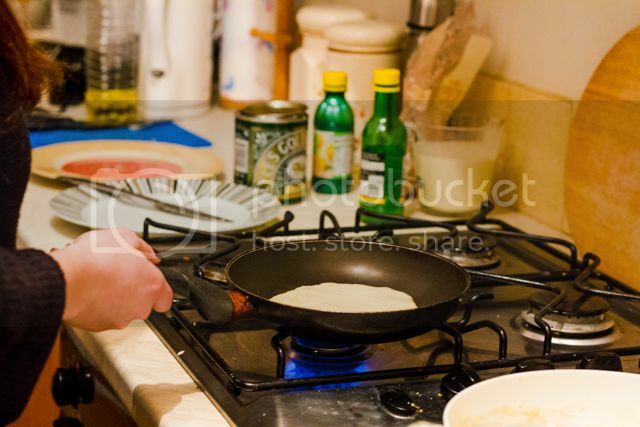 What did you do for pancake day, anything special? 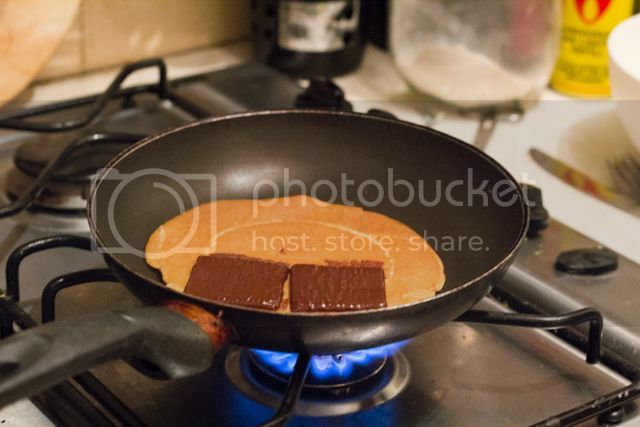 After eights in pancakes... now THAT is a revelation. I need to try this asap. they look so delish! we are about due for a pancake dinner---might be working that into our schedule soon! I was away from home so had zero pancake activity. Then I thought I would make up for lost time last night but by the time I got home at 7pm all I wanted was a takeaway pizza! If I see any pancake related-ness reduced this week I shall be tempted!